Monsoon madness in Assam, Bangladesh and Mumbai! 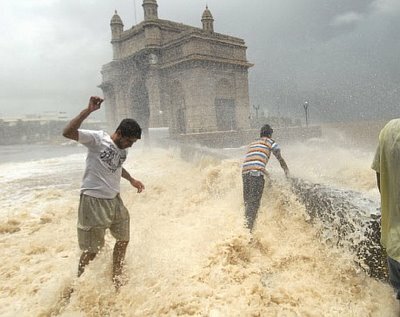 As monsoon was starting to revive after remaining dull since June 18, it brought Indian city of Mumbai to a complete standstill while many cities of Bangladesh experienced unusual torrential rains that have so far killed some 110 people in the southern parts of the country. Every year the annual monsoon season bring death and destruction to the Indian Sub-continent either in the face of floods or cyclones. Mostly poor living conditions and overpopulation is blamed for high number of deaths in the region. After playing hide and seek for nearly two weeks, the heavens made its presence felt in the city on the morning of June 28. This year the rainy season started late in the city but all that changed as Mumbaikers were amazed to see the season’s first proper rain that brought the city to a halt. The heavy showers disrupted the rail and road traffic. Overnight rain was recorded to be 75 mm that occurred with gusty winds till 9:00 am IST. While till 5:30 pm IST, about 40 mm rain again occurred in Mumbai. Worst floods since 1998 has so far killed 27 people in the Indian state of Assam, same thunderstorm activity that brought floods to neighbouring Bangladesh. The floods have affected about 1 million people in the state. The unusual torrential monsoon rains that started from June 25 have created chaos in the small Muslim republic of Bangladesh. 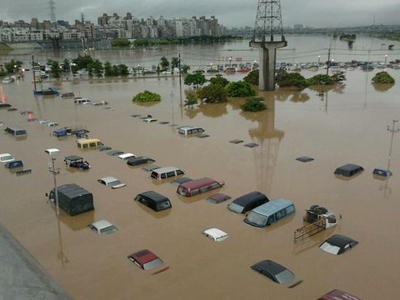 The hardest hit was the second largest city of Chittagong where about 400 mm rainfall occurred in just 12 hours. About 110 people have died while more than 250,000 people have been affected by the recent flooding rains in the former East Pakistani state. The south-west monsoon season was delayed in the country this year, but locals in Bangladesh are terming the recent flooding rains as the worst in years. This activity would ease during the coming early week but it could again take shape with the formation of the cyclonic circulation and monsoon flow in the Bay of Bengal. ← Pakistan Weather Update & Monsoon Alert (June 25 – July 9) – NEW! During the coming week monsoon would start to advance into more parts of central India which it failed to do so after June 18. Upper air cyclonic circulations has formed in the north-eastern Bay of Bengal. Monsoon would revive during the first week of July, tropical storm ‘Doksuri’ to affect the monsoon flow. Arabian sea branch also improving. Overall monsoon is behaving as forecasted by PWP from June 26.
where is the cyclone doskuri forming? is it positive for moosoon or negative? and where it will attack? In the western Pacific ocean, making landfall over China..
so will it effect positively on moonsoon or negative? lower sindh main kessi rain expected hay?